TOKYO (TR) – Japan’s Chief Cabinet Secretary on Monday said that the number of wooden boats likely from North Korea that have been found along the nation’s northern shores this year is set to be a record high, reports Fuji News Network (Nov. 12). 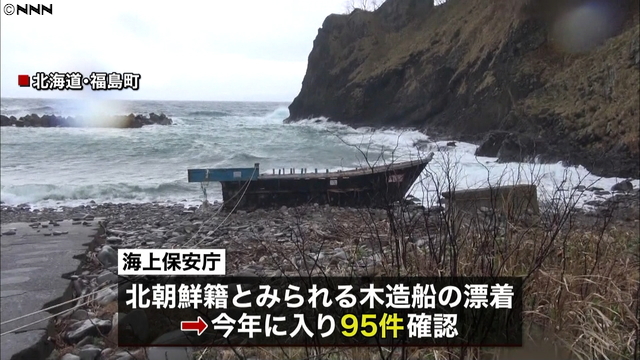 In speaking with reporters, Yoshihide Suga in speaking with reporters said that 89 such vessels washed shore in northern Japan through November 9, a figure that is on pace to exceed that for 2017. “Since October, there have been many days when the the Sea of Japan was rough,” Suga said in explaining the high number for 2018. According to the Japan Coast Guard, a record 104 suspected North Korean vessels washed ashore last year. In 2016, the figure was 38. Over the past weekend, at least four unmanned vessels were found on the coasts of Aomori and Hokkaido prefectures. No persons were found in the vicinity of either vessel. In two cases, hangul writing, which is the script of the Korean language, was found on the bows of both vessels. “We will continue to take all possible measures to ensure public security,” Suga added.